We crossed the border from Belize to Guatemala at Ciudad Melchor de Mencos. The formalities were simple, reasonably well organised and took a little over an hour for all three vehicles. We were charged about $20.00 USA as an "exit charge" when leaving Belize. Entry into Guatemala generated four charges, three paid directly and one paid into a local bank. We were charged about $10.00 USA to spray our tyres (we were classified as a bus!). There was a $2.00 USA charge per person. Road tax for 40 days was about $6.00 and there was an additional $3.00 charge for crossing the bridge (we think). Whilst the road on the Belize side of the border was good tarmac, the first few kilometres in Guatemala were poor dirt. However as we approached Lago Peten Itza things improved, and the road to Tikal was excellent. Tikal, as I am sure you are aware, is one of the most impressive Mayan cities. Although first settled in around 700 BCE the bulk of the impressive temples date from around 700 CE. 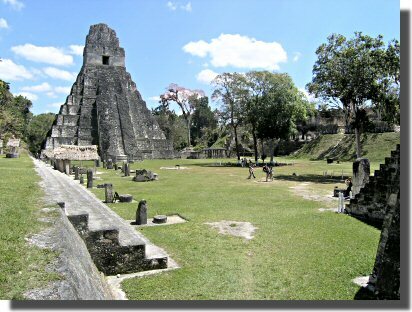 By the middle of the Classic period Tikal's population was around 100,000! Like most Mayan cities Tikal's importance waned around 900 CE. Tikal was eventually "lost" in the jungle and re-discovered around 1848. At that time none of the buildings (some of them are 60 metres tall) were visible above the jungle. In response to persistent questioning by Lesley our guide explained that the "altars" in front of the temples were only used to sacrifice birds. 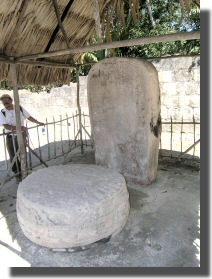 (The human sacrifices took place in a small courtyard to the side. It seems three classes of human sacrifice were made. Two voluntary, one not. The captan of the winning "ball game" team was sacrificed as was the occasional beautiful virgin (being cross eyed was considered particularly beautiful). The voluntary victims underwent very fast open heart surgery whilst drugged. Defeated enemies were mutilated then beheaded without benefit of anaesthesia. Since Tikal we have meandered south and are currently parked at the Parque Nacional Las Victorias at Coban (N 15.475003 W 90.382827).